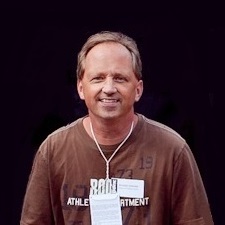 Issue #533 showcases the publication's first-ever guest editor. Ha ha. 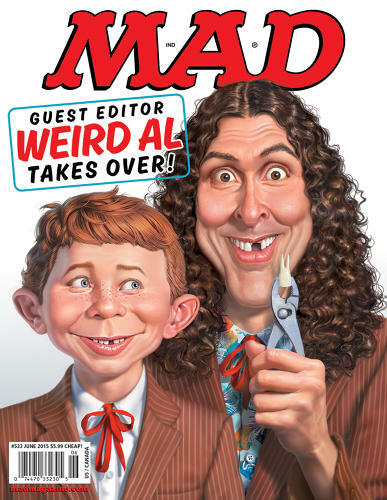 Via Fast Company contributor Susan Karlin’s preview of the Mad magazine issue guest edited by Weird Al Yankovic, we learn that when he proofed the finished issue, he caught and corrected a typo in one of the advertisements. The issue, which comes out April 21, offers a three-page spread from Weird Al’s notebook – ideas that never saw the light of day, like a “Motel California” Eagles parody. Another page is Mad artist Tom Bunk’s visit to a Weird Al concert. Yankovic also wrangled bits from his misfit celebrity pals – Seth Green, Chris Hardwick, Patton Oswalt, Emo Philips, Night at the Museum writer Thomas Lennon and The Daily Show’s Rich Blomquist, Kristin Schaal and John Hodgman. Yankovic, heavily influenced by Mad magazine growing up, is the publication’s first-ever guest editor. T-shirts featuring the cover image will be sold via Yankovic’s Mandatory concert tour, which kicks off in Las Vegas on May 12. And as Karlin notes, Al also wrote the introduction to Mad’s Greatest Writers: Frank Jacobs, a book arriving Friday.